The LG 55EA9800 is a 55" OLED television with a curved 1080p display and built-in streaming services. As a THX certified display, this TV has gone through a rigorous design and laboratory testing process, which includes more than 400 data points designed to fine-tune image quality and signal processing. LG's app-based Smart TV interface features a web browser and allows you to stream audio and video content over the TV's 802.11a/b/g/n Wi-Fi connection. Bluetooth 3.0 is also built-in for connecting to other Bluetooth enabled devices like keyboards and headsets. This OLED TV includes 4 pairs of 3D glasses and can convert content back and forth between 2D and 3D. 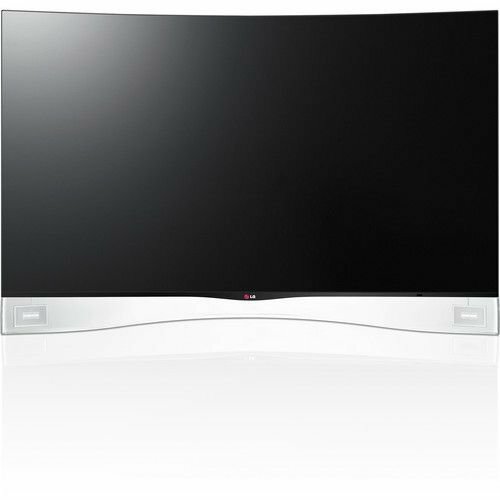 This TV also comes with a motion detecting remote control, which simplifies navigation and web-browsing. For connecting multiple high-definition sources, this TV is equipped with 1 component video and 4 HDMI inputs. This model also includes a video-call camera, which allows Skype subscribers to video chat in full HD resolution. Box Dimensions (LxWxH) 57.0 x 38.0 x 17.0"